In one of the group, one sister said that her friend was going to Shirdi so I posted my card to that sister’s place. She gave to her friend and friend took it Shirdi. After I posted card on Thursday that was also my engagement day, but even after 4 days that sister didn't receive my card, as she had taken responsibility to send card to Shirdi, she was eagerly waiting along with me. She was waiting to receive my card so that she can give the card to her friend in time. I said her to wait for one day and we also thought to leave this responsibility to Baba, and on the same day evening she received my card and gave it to her friend. Here comes the main experience, that sister’s friend started on Wednesday, reached Shirdi on Thursday. If I am not wrong ,if any devotee gives anything to Pandit ji in Samadhi Mandir he will just keep it near Baba and give it us back but see my Baba's blessings when sister's friend gave my card to pandit ji he didn't give it back and instead he kept my card near Baba's feet for so much time. They gave it to pandit ji at 9:30 am even after opening Shirdi live darshan I was able to see my card near Baba's feet at 3:30 pm. My another experience is I have read in so many experiences that Baba had attended their wedding when they invited Baba, so I was also waiting Baba to attend my wedding in any form. I was waiting in which form Baba would attend my wedding. After some days we were checking all the gifts, then I thought that may be Baba would come in the form of an idol as a gift. When we were opening the gifts one by one and while opening every gift I was thinking that it may be Baba. But all the other gifts came, but Baba was not there. Then when we opened one gift without much expectation and Yes it was my Baba in the form of an idol. My heart was filled with happiness that finally Baba attended my marriage. Thanks Baba for everything, don't ever leave me. I can't do anything without You. Love You Baba. 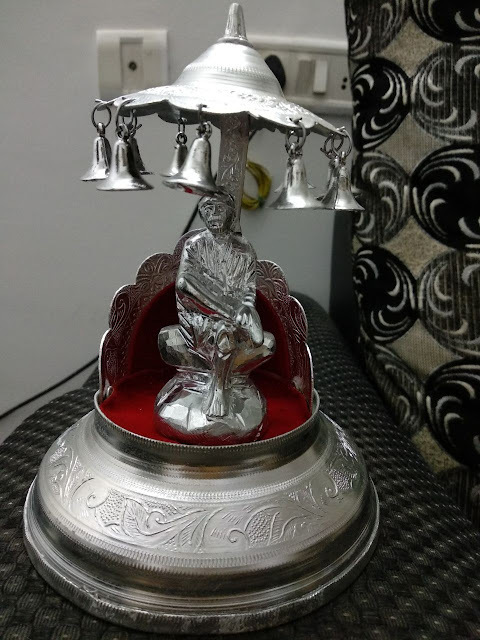 Also kindly find below attached image of Baba’s Idol that I received as my wedding gift. Baba never neglects any pure hearted invitation. He makes sure to come in any form and requires no conveyance. My marriage itself was a miracle. I too had gone to Shirdi especially to invite Baba. Baba not only came as a beautiful idol but many many miracles took place and even the atheists got convinced to see Baba’s unfathomable miracles that day. Sharing the link for those who would like to read (My life changing experience and worth reading) Sai Baba’s Presence In My Marriage. Can’t thank You Enough Baba, will always be indebted to You. Love You Saimaa. Jai Jai Ho Sai. What an amazing experience. May you be blessed with a very happy married life. Was getting goosebumps reading both experiences. Omsairam. Shri Sad guru Sainath Maharaj ki Jai. May Baba bless me also with a good husband and i would also invite Baba in my marriage.